We recently ran a Chain of Command convention game based on the 1941 attack on the Corinth Canal bridge and I think that’s when the seed was planted. That scenario went through several rounds of play testing as we attempted to, well, give the commonwealth side a chance, at least in a game sense. Even after toning down the Fallschirmjagers to 5 command dice, the effect of Elite troops fighting Regular troops was huge. Luckily, the game is very sparing with who it categorizes as Elite (with or without 6 Command dice) and equally so on the other end with who it categorizes as Green (with or without 4 Command dice). Most units that fought in WW2 were close to average so that’s as it should be. However, since moving a full step up or down in quality was so rare and had such a large impact, I got thinking about what some sort of half step in quality might look like. How unit effectiveness is modeled in Chain of Command is actually quite subtle and complex, consisting of troop quality (Green, Regular or Elite), command quality (4, 5 or 6 Command Dice) and other factors (More about these later!) Discounting the “other factors” for a moment, that gives us 9 combinations of troop and command quality, of which 2 are extremely improbable (Green Troops with 6 Command Dice and Elite Troops with 4 Command Dice) and 2 others unlikely in a WW2 framework (Regular troops with either 4 or 6 Command Dice). Is that enough, or do we need more granularity? I think the answer lies in the increasing number of “other factors” that have gradually been introduced into the game via army lists, scenarios and pint-sized campaigns to nudge units into those in between areas. While 1 vs 2 Senior Leaders is a TO&E question, the others (Superior Junior Leaders, Inferior Senior Leaders, Extra 1 time use Command Dice, CoC points on a single 6, etc.) are all attempts to to adjust the range of command quality and model better or worse than average units. Since better than average command capabilities are already being modeled, doing the same for troop quality seems worthwhile. Reroll hit on 6. 1-3 = no hit. 4-6 = hit. Experienced Troops have two attributes that differ from normal troops. 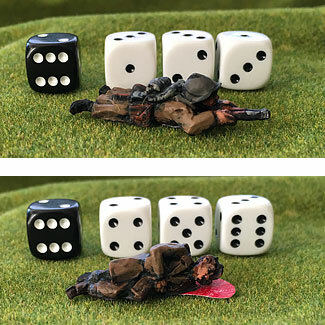 The first is that any time they are fired at and hit on a roll of 6, that die is rerolled. On a subsequent roll of 1-3, that hit is disregarded while on a subsequent roll of 4-6 means the hit remains. This makes the vulnerability of Experienced Green troops halfway between Green & Regular and that of Experienced Regulars halfway between Regular & Elite. The second attribute is that Experienced Troops add 1 die in Close Combat but are otherwise treated as their base quality. This gives them a half a quality grade edge in Close Combat. That’s all it takes! Chain of Command is a great game, but I think this extra tool will allow even better modeling of the differences between units. For those that use the Coculator, Experienced Green Troops would reduce their points by 1/6 and Experienced Regulars would increase their points by 1/6. If you end up trying out these rules for Experienced Troops in your games, let me know what you think of them!